An “ex-convict” he is. That was how former seminarians were referred to in the days I was in the seminary myself. It was a satirical way to describe someone who had been living a semi-cloistered life finally finding himself in the outside world. Michael Angelo Lobrin was a couple of years before his ordination to priesthood in the Catholic Church, but the deacon then at San Carlos Seminary after consulting with the late Cardinal Sin decided he could serve God better as a layman, hence, starting a new life outside of the seminary as Michael Angelo – comedian, motivational speaker, philosophy professor, and entrepreneur. He is also on TV, starring in a sitcom his production company (Michael Angelo TV Productions) churns out weekly. And on Jan. 27, #MichaelAngelo: The Sitcom begins its 13th season on GMA News TV (Channel 11 on un-cabled TVsets and on Cignal; Channel 24 on SKY). Not to mention his off-and-on stints on the radio. Oh, he is also a best-selling author (check out best-selling titles at National Book Store and you will likely see Laugh With God on it). You don’t have to like the guy, but I am sure even if you don’t you will find yourself laughing at his punch lines, so to speak, mostly laced with satire, parody and at times mockery. Michael Angelo is a self-deprecating comedian who finds humor in his own experiences. At the last time he met with the entertainment press a week after New Year, everyone on the second floor of Limbaga 77 was in stitches while Michael Angelo talked about his plans for this year. It started as a talk show, but folded up after six weeks due to things he wasn’t aware of, like plastering all over the set the Point of Sales (POS) and advertising material of his major sponsor, San Miguel Corporation. But, again, he believes that when a door closes, a window will open. So, after delivering an inspirational talk to employees of Agro Ventures, Inc., owner of Chooks-To-Go, the owner offered to sponsor his show. Now he has a roster of supporters that believes in him, they won’t let him go. Don’t introduce Michael Angelo as a self-made man. He says, “There’s no such animal as a self-made man. Bakit, wala ba siyang Nanay, wala ba siyang Tatay, wala ba siyang mga kapatid at mga kamag-anak?” That’s the kind of humor you’d hear in his inspirational talks. You may not be inspired but you will certainly be entertained. 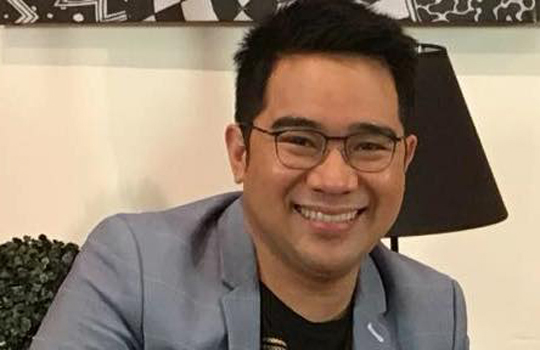 GMA Network has given him timeslots for the Holy Week, and he is producing shows that will be called #MichaelAngelo Holy Week Reflections, a travel show featuring the Holy Land. And that is apart from the drama shows that he will do, similar to those that got the rival channel thinking twice. Join the cool experiments with award-winning host Chris Tiu, the wacky duo of James & Roadfill of Moymoy Palaboy, Kapuso Starstruck alumni Nikki Co, Liezel Lopez, Faith Da Silva, and Cebuana actress, Kapuso Devon Seron tomorrow in I-Bilib. Join James and Roadfill as they have fun doing the Bilibabol Dancing Tower with Kapuso cuties Nikki, Liezel and Faith. For Huling Hirit, Devon celebrates the Panagbenga flower festival of Baguio with a delicious Fruit Flower Art. The eighth and final season of Game Of Thrones will debut in Asia same time as the U.S. on April 15 at 9 a.m. exclusively on HBO GO and HBO. The debut date was announced with a new tease that was just released, entitled Crypts of Winterfell.